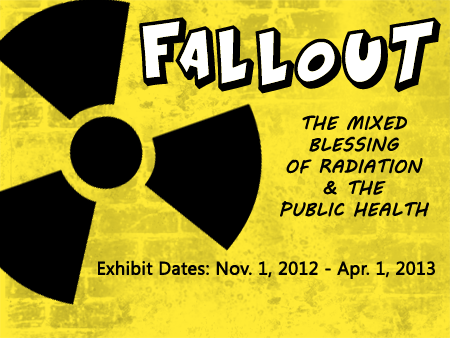 Here on the west side of campus we have an engaging exhibition entitled: Fallout: The Mixed Blessing of Radiation & the Public Health. One visitor suggested, "...this is the coolest compilation of things I didn't know about radiation." The exhibition covers the time period of 1895 to the present and is culturally contextualized in terms of how x-rays, radiation and radioactivity have influenced diagnostics, treatment, occupational health protocols, politics, the teaching of radiology, the public's engagement with fallout shelters, the aftermath of nuclear accidents and the like. In addition to a narrative which weaves together the conflation of these three fascinating topics, x-rays, radiation and radiotherapy, there are artifacts, photos and provocative printed matter which illustrate this multi layered subject. For example, one can learn the story of UW's unfulfilled connection with Madame Curie or see the switch (usually held by the University Archives) that cut off the electricity before the first atomic bomb detonation. In short, if you are looking for a field trip to take up your student's class time when you have to go to a conference, if you'd like to bring your class, if you'd like to assign a visit to the class for extra credit...this is an open invitation to visit. Especially for those who may be reading Radioactive as part of UW's Go Big Read program, Fallout was imagined in response to that initiative, so it would be particularly germane to your class.